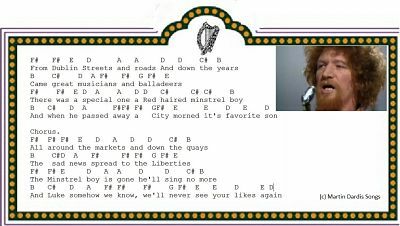 The Dublin Minstrel Song lyrics and guitar chords. A great tribute to Luke Kelly. Written by O'Donoghue, my thanks to Paul Tyrell for the guitar chords. well done. 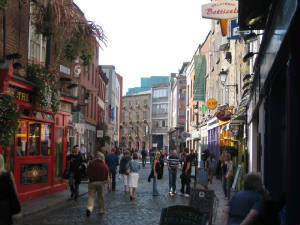 Recorded by The Dubliners with Patsy Watchorn doing the singing. I have been meaning to give these lads a mention for ages. They run The Fingal Folk Club in Ballyboughal Co. Dublin. Morning Dew is the name and the lads host the session every Friday night from 8-10Pm. It's an open session away from the pub scene and they give the young people a chance to sing and play their music with a band. All are welcome to join in this friendly gathering of young and old. No alcohol allowed. 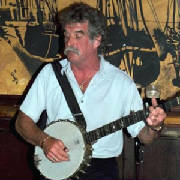 The song being played in the video is The Dublin Minstrel with Ted O'Reilly singing, Ronnie Delaney on guitar and V Delaney on Bodhran.